Most pet food is something called 'feed grade'. 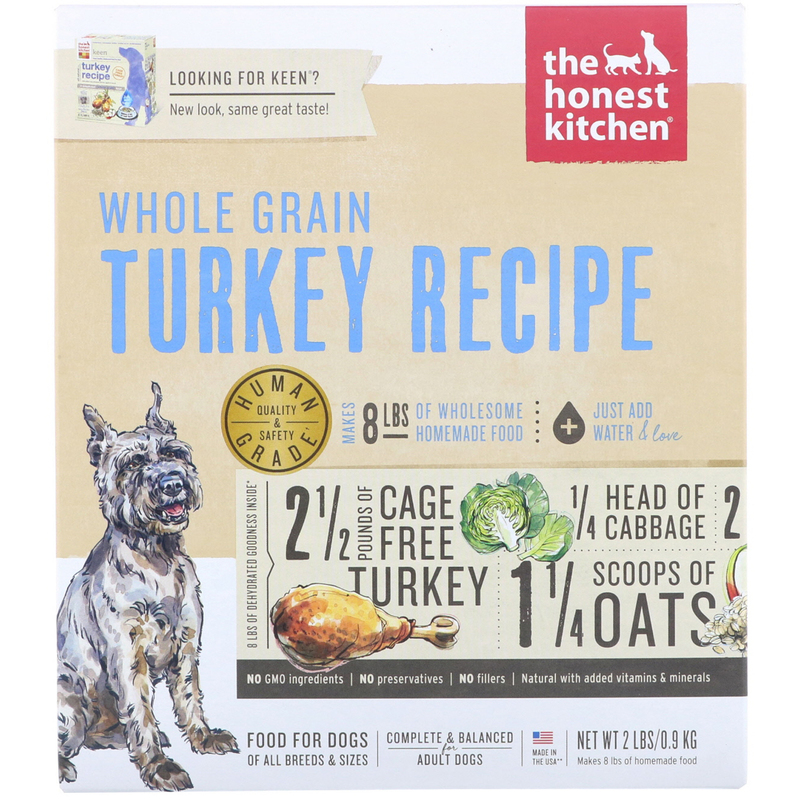 The Honest Kitchen is the world's first 'human grade' pet food made with 100% human grade ingredients and produced in a human food facility. That means higher quality ingredients and more safety standards, just like you'd expect in your own food. But it's for your dog to eat, not you! Complete & balanced: Whole Grain Turkey Recipe is formulated to meet the nutritional levels established by the AAFCO Dog Food Nutrient Profiles for adult maintenance. †This product is made with human food grade ingredients. It contains no animal feed grade ingredients and is made in a human food production facility but is intended for your dog to eat, not you! 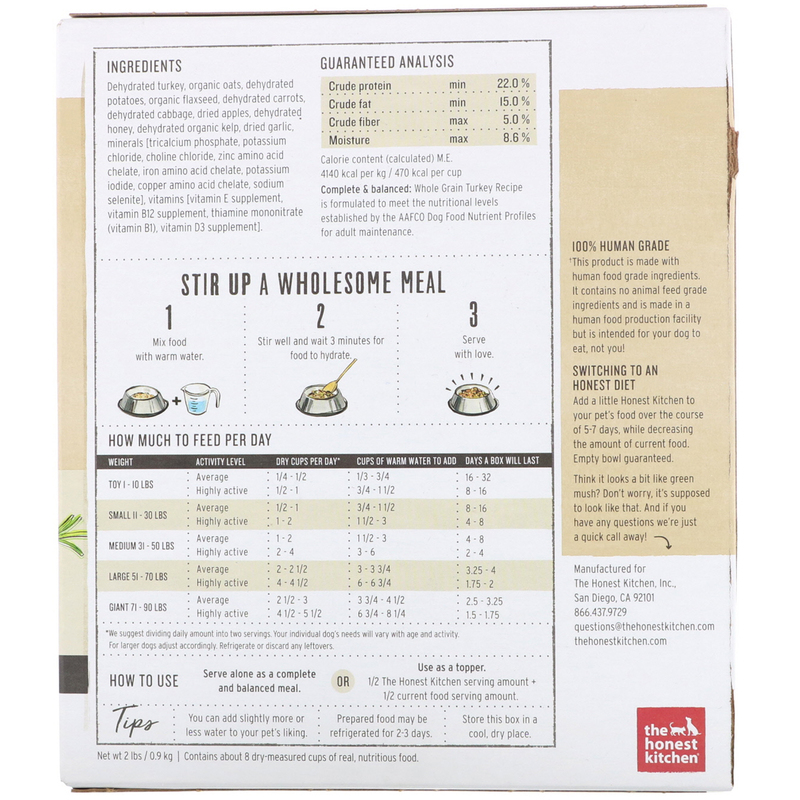 Add a little Honest Kitchen to your pet's food over the course of 5-7 days, while decreasing the amount of current food. Empty bowl guaranteed. You think "different." Your dog thinks "delicious". When you don't use preservatives, you have to get creative. We keep our ingredients fresh by gently dehydrating them and finely dicing them up for easy digestion and nutrient absorption. It might look strange to you, but to your dog, it's downright gourmet. *Estimate based on some of our fresh ingredients before dehydration. *We	suggest dividing daily amount into two servings. Your individual dog's needs will vary with age and activity. For larger dogs adjust accordingly. Refrigerate or discard any leftovers. Serve alone as a complete and balanced meal. Or Use as a topper. 1/2 The Honest Kitchen serving amount + 1/2 current food serving amount. You can add slightly more or less water to your pet’s liking. Prepare food may be refrigerated for 2-3 days. Dehydrated turkey, organic oats, dehydrated potatoes, organic flaxseed, dehydrated carrots, dehydrated cabbage, dried apples, dehydrated honey, dehydrated organic kelp, dried garlic, minerals [tricalcium phosphate, potassium chlorine, choline chloride, zinc amino acid chelate, iron amino acid chelate, potassium iodide, copper amino acid chelate, sodium selenite], vitamins [vitamin E supplement, vitamin B12 supplement, thiamine mononitrate (vitamin B1), vitamin D3 supplement].